It’s fascinating how Jesus taught. How he used these simple parables to teach us. The parable is a story where Jesus draws comparisons between one thing and another. In the parable of the mustard seed, the primary point of comparison is the contrast between the smallness of the seed – the smallness of the start – and the greatness of the result. 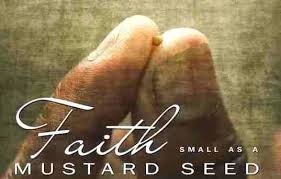 The Kingdom of Heaven is like a mustard seed. Jesus is telling us how God chose to build his kingdom. He chose to do it in a small way. A baby born in a stable, who grew up and at the appointed time recruited 12 very ordinary men, in a remote providence of the Roman Empire. Jesus doesn't tell us why God chose this way; as the old saying goes: “God works in mysterious ways!” And God’s way of building the kingdom is in the small things of life. So his message for us today is don’t wait for some big thing, some great call or mission. God works in the small things. The qualities Jesus taught us to seek were not the ones that made us feel important; just the opposite – humility, love, patience and mercy – were the virtues he valued. He said: “Blessed are the poor in spirit.” – “Blessed are the meek” – for theirs is the kingdom of heaven. Which means that none of us can say: "Well, I am a nobody, too small to matter.” because God says it’s all about small things. At the end of Matthew’s gospel Jesus speaks again about the final judgment. And he says what will matter to God is not material success, great accomplishments, or the great missions we take on. The only things that will matter to God will be our little acts of kindness. This passage tells us “The King will say: ‘I tell you, whatever you did for one of the least important of these followers of mine you did it for me!’” (Matthew 25:31-46) The kingdom of heaven is built on each kind word, each small act of compassion. Those are the seeds of the kingdom. We don’t think much about these daily little actions. But each is a seed that has the potential to change a life, and the lives of all who know them. Jesus is saying that’s how the Kingdom grows – slowly; one branch at a time, one leaf at a time, one person, one life changed by some small kindness at a time. Our call as Christians is to let go of the need for something big. When we talk about faith, what we are saying is we accept God’s kingship in our life. We let Him rule. And this faith is like a seed that we need to nurture, to grow. What are the weeds that choke out our faith? We know what they are! We know those things that choke our spirits. For some of us it’s excessive partying. For others it’s making money our God. For some of us it’s pessimism, hopelessness and fear. Many of us are unwilling to forgive someone, and that hatred is choking our spirit. A few of us have become paralyzed by grief. Jesus is asking us today to root out these weeds; to root out attitudes and ideas that have taken hold which have no place in the kingdom of God. Jesus’ parables are designed to tease our mind to startle our imagination to make us think. The mustard seed story challenges us to think small; to see that even though we are one small person, if we grow our little faith, it can be a blessing and to those around us. The story about the leaven – the yeast – challenges us to ask: “Do I have patience with God’s work, His slow and seemingly hidden building of the Kingdom, or will I be impatient and always seek something around the next corner. Jesus used these simple, mundane things – seeds – yeast – weeds – to present to us life-altering challenges. His use of these small, common things is a lesson for us by itself. The message is that the most important lessons in our life can come from the small moments, the mundane moments, from the small challenges we face each day. In each of the small moments of our lives we fashion parables too; little stories and events that build the kingdom of God. When the woman next door, who has been unpleasant – even mean for years – falls ill and her neighbor brings over a meal made with love and stays for a visit — a parable is taking place. When a mother loves her teenage daughter, even though she just screamed “I hate you!” and slammed the bedroom door – a parable is being lived. When a husband and wife stop in the middle of a stupid fight and forgive each other – a parable is happening. When an infertile couple conceives then goes ahead with the planned adoption anyway, because that child needs a home — a parable appears before our eyes. So what will it be in your life? That’s really the question Jesus is asking today. What parable of the kingdom will be made visible in your life? When you give it over to God; when you live in the power of the Holy Spirit in all the little mundane things and moments, then the Kingdom comes alive in your life. Then … you will shine like the sun in the kingdom of the Father. God you don't scare me anymore. Jesus was a rebel. What's the message for us?